Lithium is an alkali metal naturally found in minerals and seawater. Compounds of lithium salts, most commonly lithium carbonate, have been used for medicinal purposes since the 19th century. Historically, lithium has been used to treat a range of diseases, including gout and hypertension, but currently it is primarily used to treat bipolar disorder.1 In bipolar disorder, it is a common adjunct mood stabilizer for patients prone to manic episodes or suicide. With an estimated one to three percent of the world’s population suffering from bipolar disorder, lithium’s use is widespread.2 Although widely used, lithium has a narrow therapeutic window and toxic levels can lead to a variety of systemic symptoms which confer significant morbidity. Ahead, we will review the pharmacology of lithium, outline its use in modern medicine, and discuss severe lithium neurotoxicity in order to highlight its presentation, diagnosis, and treatment. The main inhibitory neurotransmitter, GABA, plays an essential role in regulating both dopamine and glutamine. GABA levels are known to be decreased in those with bipolar disorder and low GABA levels lead to excitotoxicity, which is counteracted by lithium, contributing to its neuroprotective properties. Additionally, lithium also enhances the release of several neuroprotective proteins. As previously mentioned, lithium toxicity is not uncommon due to its narrow therapeutic index. Lithium toxicity presents with a variety of clinical manifestations including renal dysfunction, neurologic dysfunction, gastrointestinal symptoms, cardiac manifestations, and endocrine abnormalities. The mechanism for injury on each system is not completely known. Lithium toxicity can also develop because of drug interactions, such as atypical and typical antipsychotic. Occasionally, lithium toxicity can be mistaken for other syndromes associated with antipsychotic use. As stated previously, lithium increases serotonin metabolites in the CSF. Lithium toxicity in combination with SSRIs may lead to a serotonin-like syndrome. A similar mechanism is seen with neuroleptic malignant syndrome given the synergistic effects lithium has on neuroleptic drugs.9 In a meta analysis of lithium toxicity, one case presented with increased pulse rate, blood pressure, and temperature in a patient consuming a combination of lithium and a neuroleptic drug.9 It is important to consider polypharmacy as a contributor to the development of lithium toxicity. There are three main types of lithium toxicity: acute, acute on chronic, and chronic. Acute is considered in any patient who is lithium naïve and consumes a large amount of lithium at once, acute on chronic is seen in patients who have been on chronic lithium and overdose, while chronic toxicity is a slow accumulation of lithium in patients who have a decreased ability to excrete the drug due to the its side effects.10 The severity of disease has been shown to have correlation with the type of lithium toxicity, with chronic toxicity resulting in the highest incidence of severe disease. The standard treatment strategy of lithium toxicity generally involves stabilization by primary survey, cessation of lithium administration or any medications that may reduce lithium elimination, hydration, gastrointestinal decontamination, and enhanced elimination via extracorporeal treatments of enteral treatments. However, due to the relatively long time course involved in lithium poisoning after presentation, it is not unreasonable in certain non-life threatening cases to choose a conservative course of action, while monitoring serum lithium levels and renal function, so that treatment can be adjusted as necessary. Regardless of the level of toxicity, patients should be admitted for hospitalization; the level of acuity is dependent on the severity of the symptoms. In severe situations, for example when seizure or altered mental status is present, the patient should be admitted to an intensive care unit for further management. Once lithium toxicity is suspected, a primary survey should be rapidly conducted to carefully assess the patient’s airway and breathing. After the patient’s airway and breathing are stabilized, the primary concern should be restoring volume by administering intravenous normal saline; a patient in a hypovolemic state seems to benefit the most from this, as many will experience a large decrease in total body fluid as a direct result of polyuria and concomitant central and nephrogenic diabetes insipidus secondary to lithium use.11 Hydration also promotes the renal excretion of lithium. Total volume resuscitation should be at least two to three liters, assuming normal cardiac function. Sodium levels should be monitored closely, as hypernatremia may occur when large amounts of normal saline are administered. Lithium is concentrated in the thyroid gland three to four times more than in plasma.24 It inhibits release of preformed thyroid hormone by alteration in tubulin polymerization and also by inhibition of the stimulatory effect of TSH on the cAMP pathway.25 The incidence of goiter with lithium treatment is estimated to be 30 percent to 55 percent, while the prevalence of hypothyroidism with lithium treatment ranges between six percent and 52 percent. Lithium has been associated with rare case of hyperthyroidism as well. One report noted that 20 percent of Lithium-treated patients have antithyroid antibodies, compared with 7.5 percent without Lithium treatment.26 The same study observed increased B-cell activity and a decreased ratio of suppressor to cytotoxic T-cells, as well. Erica Altschul, DO is an Internal Medicine Resident at Lenox Hill Hospital in New York. Craig Grossman, MD is an Internal Medicine Resident at Lenox Hill Hospital. Renee Dougherty, DO, MS is an Internal Medicine Resident at Lenox Hill Hospital. Rahul Gaikwad, MD is an Internal Medicine Resident at Lenox Hill Hospital. Vina Nguyen, MD is an Internal Medicine Resident at Lenox Hill Hospital. Edward Merker, MD is Associate Director of Endocrinology and Associate Clinical Professor of Medicine (Endocrinology) and Geriatrics at Icahn School of Medicine at Mt. Sinai Hospital. 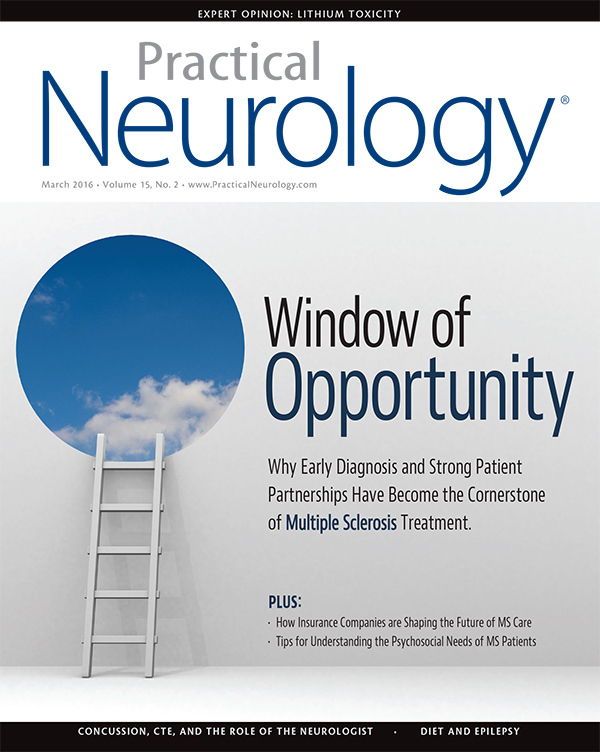 Steven Mandel, MD is a Clinical Professor of Neurology at Lenox Hospital and Hofstra NorthWell School of Medicine. 1. R. Oruch, M. A. Elderbi, H. A. Khattab, I. F. Pryme, and A. Lund, “Lithium: a review of pharmacology, clinical uses, and toxicity,” European Journal of Pharmacology, vol. 740, pp. 464–473, 2014. 2. Marmol F. Lithium: bipolar disorder and neurodegenerative diseases Possible cellular mechanisms of the therapeutic effects of lithium. Prog Neuropsychopharmacol Biol Psych. 2008;32:1761–1771. doi: 10.1016/j.pnpbp.2008.08.012. 3. Cipriani, A.; Hawton, K.; Stockton, S.; Geddes, JR. (2013). “Lithium in the prevention of suicide in mood disorders: updated systematic review and meta-analysis.”. BMJ 346: f3646. 4. Scheuch, K.; Höltje, M.; Budde, H.; Lautenschlager, M.; Heinz, A.; Ahnert-Hilger, G.; Priller, J. (2010). “Lithium modulates tryptophan hydroxylase 2 gene expression and serotonin release in primary cultures of serotonergic raphe neurons”. Brain Research 1307: 1421. 5. Malhi GS (2013). “Potential mechanisms of action of lithium in bipolar disorder. Current understanding.”. CNS Drugs 27 (2): 135–53. 9. Netto I, Phutane VH. Reversible Lithium Neurotoxicity: Review of the Literature.The Primary Care Companion for CNS Disorders. 2012;14(1):PCC.11r01197. doi:10.4088/PCC.11r01197. 11. McLean M MD, Sherwin H MD, Madabhushi V, et al: Case Review: A 17-Year Old Female Patient with a Lithium Overdose. Air Medical Journal 2015; 34(4): 162-165. 12. Eyer F MD, Pfab R MD, Felgenhauer N MD, et al: Lithium Poisoing: Pharmacokinetics and Clearance During Different Therapeutic Measures. Journal of Clinical Psychopharmacology 2006; 26(3): 325-330. 13. (7 & 3) Lee YC, Lin JL, Lee SL, et al: Outcome of patients with lithium poisoning at a far-east poison center. Human and Experimental Toxicology 2010: 528-534. 14. Meertens JH, Jagernath DR, Eleveld DJ, et al: Hemodialysis followed by continuous venovenous hemofiltration in lithium intoxication, a model and a case. European Journal of Internal Medicine 2009; 20: 70-73. 15. Deguigne M, Hamel J, Boels D and Harry P: Lithium Poisoning: the value of early digestive tract decontamination. Clinical Toxicology 2013; 51(4): 243-248. 16. 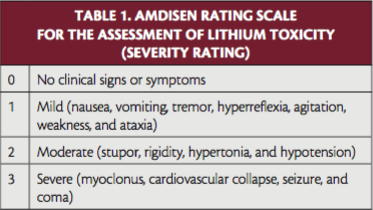 Roberts D and Gosselin S: Variability in the Management of Lithium Poisoning. Seminars in Dialysis 2014; 27(4): 390-394. 17. (8)Ivkovic A MD and Stern T MD: Lithium-Induced Neurotoxicity: Clinical Presentations, Pathophysiology, and Treatment. Psychosomatics 2014; 55(3): 296-302. 18. (9)Von Hartitzsch B, Hoenich N, Leigh RJ, et al: Permanent Neurological Sequale Despite Hemodialysis for Lithium Intoxication. British Medical Journal 1972; 4: 757-759. 19. (10)Nguyen, Lilly. Lithium II: Irreversible Neurotoxicity After Lithium Intoxication. Journal of Emergency Nursing 2008; 34(4): 378-379. 20. (11) Feldman W, Besterman A, Yu JP, et al: Persistent Perceptual Disturbances After Lithium Toxicity: A Case Report and Discussion. Psychosomatics 2015; 56(3): 306-310. 21. (12)Lang E and Davis S: Lithium Neurotoxicity: the development of irreversible neurological impairment despite standard monitoring of serum lithium levels. Journal of Clinical Neuroscience 2002; 9(3): 308-309. 22. (13) Porto F, Leite M, Fontenelle L, e al: The Syndrome of Irreversible Lithium-Effectuated Neurotoxicity (SILENT): One-year follow-up of a single case. Journal of the Neurological Sciences 2009; 277: 172-173. 23. (14)Lazarus JH: Lithium and Thyroid. Best Practice and Research Clinical Endocrinology and Metabolism 2009; 23: 723-733. 24. Lazarus,JH.Endocrine and Metabolic Effects of Lithium.New York and London, Plenum Medical Book Company, 1986. Lithium and the thyroid gland: pp. 99-124. 25. Perrild H, Hegedus L, Basstrup PC,Kayser L,Kastberg S. Thyroid function and ultrasonically determined thyroid size in patients receiving long-term Lithium treatment. Am. J Psychiatry 1990: 147: 1518-21. 26. Wilson R,McKillop JH,Crocket GT,Pearson C,Jenkins C, Burns F et al.The effect of lithium therapy on parameters thought to be involved in the development of autoimmune disease. Clin Endocrin 1991: 34:357-61. By deciding which drugs are “preferred,” insurance companies are reducing the practice of evidence-based medicine to a series of economic choices.